It’s been a wonderful writing week. I turned in my final book edits for ONE NIGHT GONE on Sunday…and then found out that my story “The Case of the Vanishing Professor,” which was published last year in the May/June issue of Alfred Hitchcock’s Mystery Magazine, was named a finalist in the Best Short Story Award for the Agathas! I first started writing the story about 12 years ago, when I got the idea of writing about a woman named Nancy Drew who really hated being named Nancy Drew. For a long time, though, I couldn’t decide what her story would be beyond that—so I kept writing a bit, then putting it away for a long time, then bringing it back out again. Finally, it came together when I put Nancy at a cheesy murder mystery dinner. It soon becomes clear that other suspicious things are going on besides the story on stage—and Nancy, like it or not, gets sucked into solving the mystery. Read the full story below. You can use the arrows and controls at the bottom of the embedded PDF to navigate through the story. You can also download the file to print and read offline. Presented with permission of the publisher. And, as if getting the nomination wasn’t enough, I’m also thrilled to be sharing the honor with my husband, Art Taylor, who is also a finalist with his short story, “English 398: Fiction Workshop.” And we are both thrilled to share the slate with the fine writers Leslie Budewitz, Susanna Calkins, and Barb Goffman. Thank you so much to Linda Landrigan and all the wonderful folks at Dell Magazines. 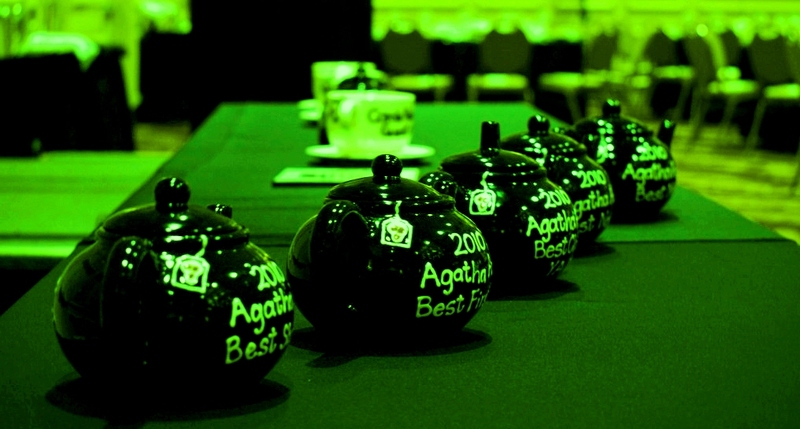 Let the partying begin—we’ll be celebrating this victory up until the Agatha banquet dinner at Malice Domestic in May. Whee! Check out the full list of nominees here. Congratulations to all!